At Rival IQ, we see tens of thousands of companies, products, and people come through our system. This gives me a unique view of what organizations are doing not only for their digital strategy but also with their overall brand marketing. One thing I’ve noticed is very few companies are doing a good job at both their corporate and product-level branding across social media channels. Here are a few tips to help guide you as you build out both your branding and social media strategy. 1. Small companies should focus on ONE brand. There are two ways to look at this. If you are a small company with limited marketing resources and a single product line, then you should focus on a single “brand”, meaning your company name and your product name should be the same. It’s hard enough to build strong brand equity for a single brand, but if you are trying to juggle your company awareness with a separate, different product brand, chances are you will do both poorly, or mediocre at best. Consistency at this level means using the same logo and company/product description in all digital channels. What someone sees on Twitter should align with what they view on Facebook, YouTube, LinkedIn, etc., as well as your website, blog and other properties. A company that just joined the Rival IQ community recently, QuadGraphics, is doing a great job at this. 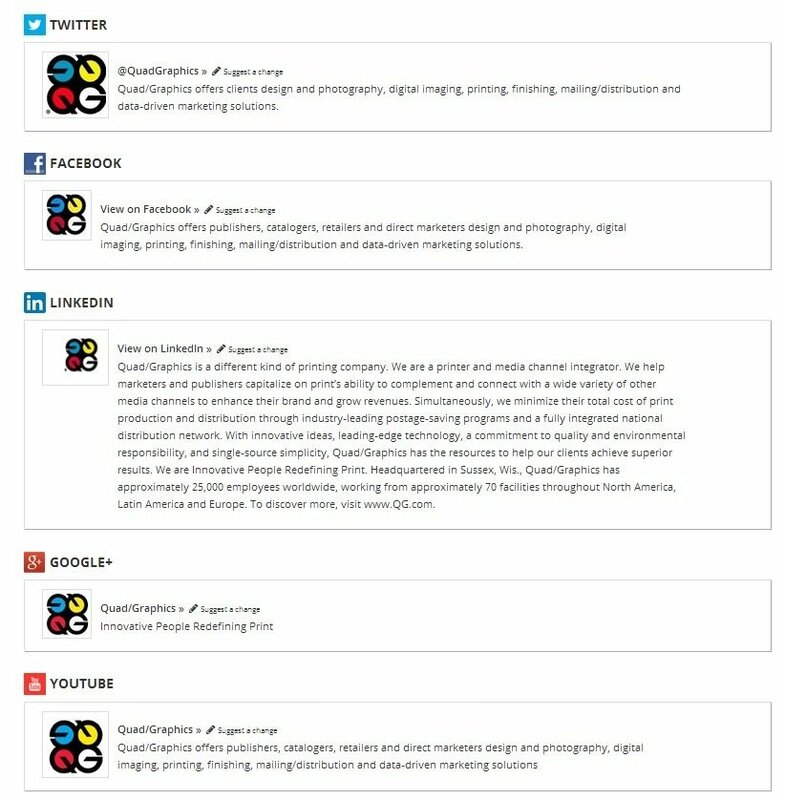 Every social channel where they have a presence has the same logo, naming structure, and positioning. Also, for a small printing and publishing firm, they have several thousand followers on Twitter and Facebook and are achieving decent engagement rates for their posts. 2. Branding should be consistent across all channels. In marketing, it’s all about consistent, compelling content that is repeated enough times across multiple places that the viewer starts to be influenced and engaged. We see a lot of companies that use completely different names or descriptions or logos. Having fun and making sure your message is tailored to each social channel is smart, but that should not extend to the basic corporate and product positioning of who are you, what is the product, what does it do, and why should I care. 3. Larger companies need to make sure company and product brands complement and support each other. If you are a company with more significant resources or with multiple products, then you’ll need to implement a strong marketing strategy for both your company and your product brands. The two need to complement each other but you need to make sure a user can find just the product easily if that is what they are looking for. For your website, this means making both the search and the navigation simple. In social, it means giving the product it’s own presence on the channels where your customers frequent. If the user has to click more than a couple times to find the product they are interested in, you will lose them. While I see more examples of this not done well – where the company and product brands get mixed up, and the consumer has to work too hard to figure it out – there are several companies doing a great job. Nike, for example, has strong global brand equity, but it’s doing a great job building out separate brands for products such as its Michael Jordan product line, which has the brand jumpman23. Another company that must manage its corporate image along with many separate products in digital marketing is Microsoft. Microsoft has perhaps one of the most complex brand hierarchies with products spanning online, such as Skype, Bing, and Internet Explorer; to business productivity software, like Dynamics or SharePoint; to developer/IT solutions, such as Visual Studio, SQL server and Azure; to consumer products across mobile, cloud storage, email, and gaming. 4. Not all brands need to be present on all social channels. For each brand, Microsoft most likely evaluated the key digital channels appropriate for that market, target customer, and demographics. 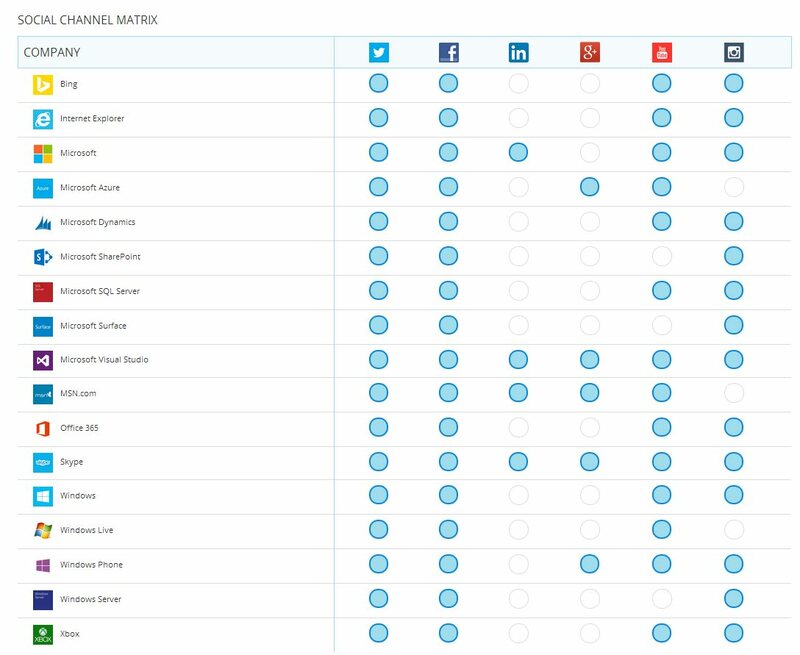 In reviewing this social channel matrix for Microsoft brands, you can see that every one has its own presence on Twitter and Facebook – table stakes for any company or product. LinkedIn includes primarily the parent brand, Microsoft, and a couple of the products. This is typical, as traditionally LinkedIn has been a place where companies show their corporate brand, recruit new employees, or promote overall company thought leadership. That is evolving with more people using LinkedIn as a demand generation and overall product awareness channel. The Microsoft brands are nearly absent from Google Plus. It’s hard not to make a joke about that, as I think that might be more political than anything else. Reality is Google Plus is becoming an increasingly popular social channel, and I would bet over 50% of the profiles in our system have a presence there. Finally, Instagram and YouTube are a mixed bag. I would expect the more consumer-focused brands, especially graphically intensive ones, like Xbox, Skype, IE, and Windows to use these networks, and, indeed, they do! 5. You need a brand czar across ALL social media. As we dig a bit deeper into the different brands’ presence, we see a bit of inconsistency. This often means that each product group is managing their own social media strategy and messaging with no one overlooking the entire thing. And few people can have the view that shows each brand side by side like we have here in our product. With the complex digital landscape in the market, larger companies need to look at how and who is overseeing the overall branding and positioning presence across all social channels. 6. Follow best practices for each social channel. Best practices in Twitter includes having a bio around 155 characters. Many brands will create a Twitter bio that simply says something along the lines of, “This is the “official” page” for our brand,” missing out on an opportunity to add valuable brand messaging, positioning, and keywords. The only two Microsoft brands that I would give an “A” grade to on Twitter bio descriptions are Office 365 and Xbox. Office 365 uses 154 characters and did a great job using strong keywords, clear positioning, and a link to its parent company @Microsoft. XBox has a strong profile, using 160 characters with keywords like console, game releases, sports, etc. However, it does not show the connection to @Microsoft (perhaps this is intentional). Microsoft brands completely missing the boat here include Windows, Windows Phone, Surface, and SharePoint. I also find Bing’s description very ethereal rather than a straight forward “here’s who we are and what we do,” which is ideal in product positioning. Other Microsoft brands could take a profile lesson from the Office 365 social team. Also, it would behoove Microsoft to look holistically across their social bios and find a way to create alignment even as they communicate distinct product values or personality. 7. Target appropriate followers for each brand. Since we know all the brands are on Twitter, let’s dig into this network a bit more. 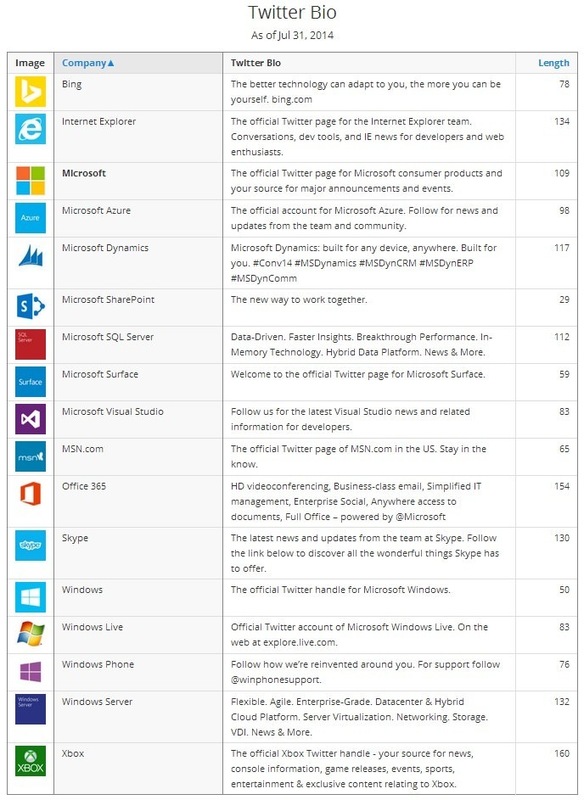 From a pure follower perspective, it’s not surprising that Microsoft has the largest number of followers. However, the parent company is followed closely by Windows, Skype, and Xbox. Don’t get hung up on pure number of followers, but focus instead on whether your follower base is comprised of your target customer who will engage and share your messages. 8. Make social activity count for each brand. 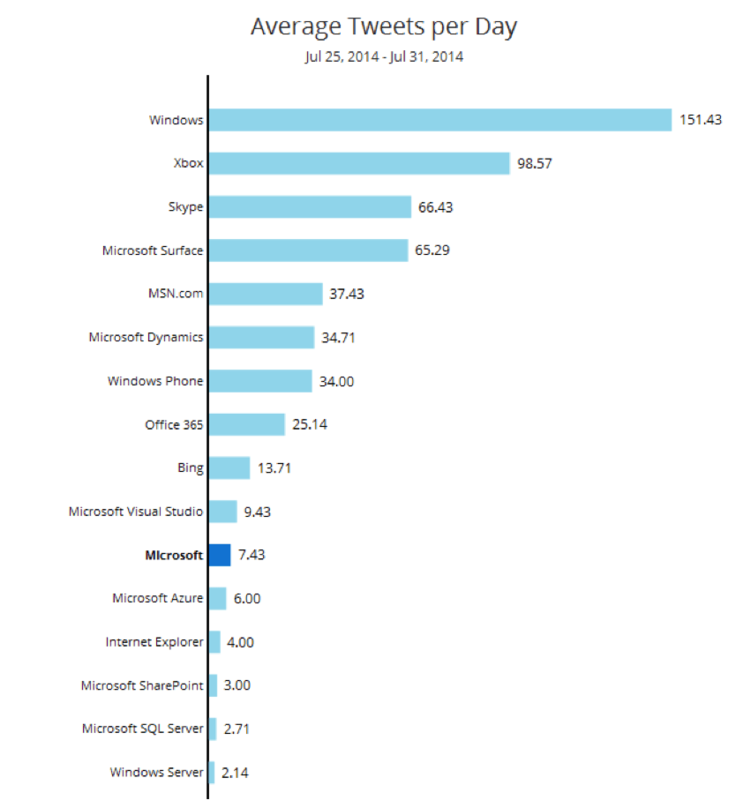 As we continue to look at pure activity, Windows is posting a crazy number of tweets, averaging over 150 per day. Xbox also is a very heavy tweeter with 98 per day. It is true that consumer brands tend to be more prolific tweeters than B2B brands, but these averages are significantly higher than the average we see across all companies and industries, which tends to be closer to 10 to 15 per day. 9. Beyond audience and activity, it’s all about engagement. One of our frequent sayings here at Rival IQ is that neither a huge follower base nor dozens of posts guarantees engagement with your community. Our Microsoft example shows this. When we dig into the top social content for these Microsoft brands, we see Xbox really stand out. They score with 25 out of the top 50 tweets based on total engagements (number of retweets and favorites). 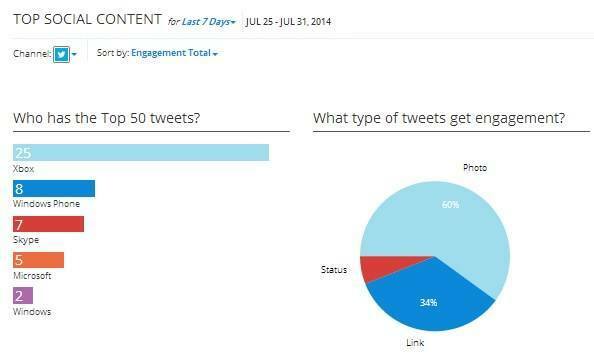 When we look at average total engagement per tweet, you can see why. 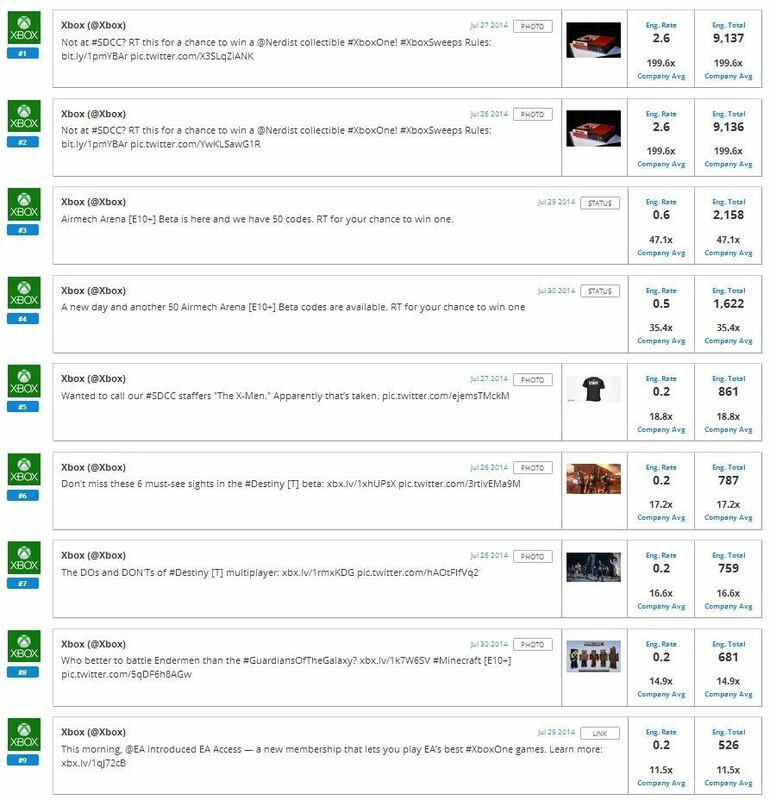 Xbox appears to be posting content that resonates with its audience, averaging nearly 80 interactions per tweet. 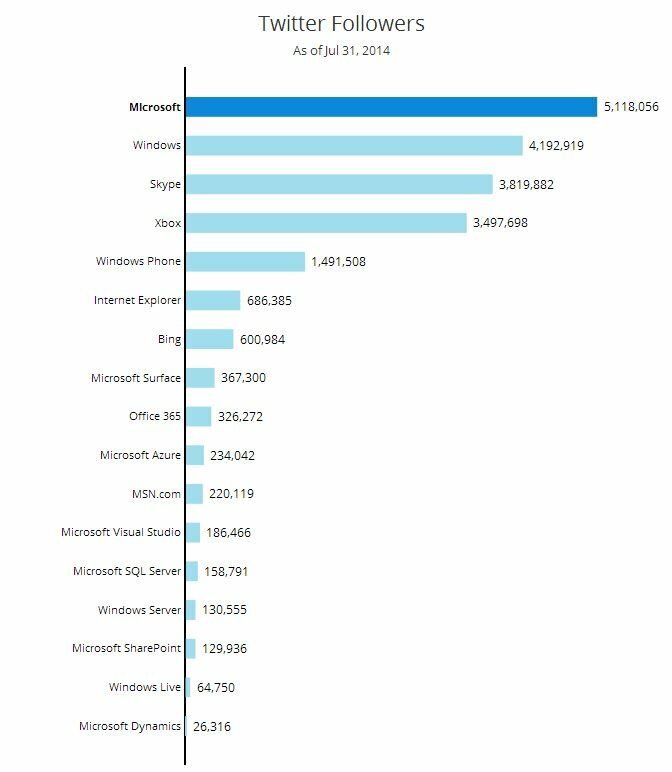 Microsoft and Visual Studio are also doing well. Windows drops off to just over 1.5 interactions per tweet on average. Windows could work on quality content rather than quantity based on this quick analysis. 10. Learn what content engages with YOUR target audience. Let’s dig down into Xbox’s top content to see what we can learn (and what its sister brands can learn). First, it’s clear that Xbox is fully leveraging its presence at the gaming conference of the century, San Diego Comic-Con (hashtag #SDCC), using the hashtag throughout. It’s also using photos well, and we can see that 60% of the most engaging tweets include a photo (photos work great with consumer brands on social media). Xbox is also using another proven successful strategy for consumer brand Twitter engagement – contests. One of its top tweets encourages its community to Retweet the tweet for a chance to win a collectable XboxOne from crazily popular gamer @nerdist. They received thousands of retweets and favorites and reached many followers, both at Comic-Con and not. I hope these ten tips will help you as you roll out your company and products on key social channels. One of the best ways to learn what is working and not working is to compare yourself against both your top competitors as well as companies you admire or that you think follow best practices and model your social content after theirs. Social media and branding are hard. Make sure you are thinking about them together to help build awareness, brand value, and market attention.